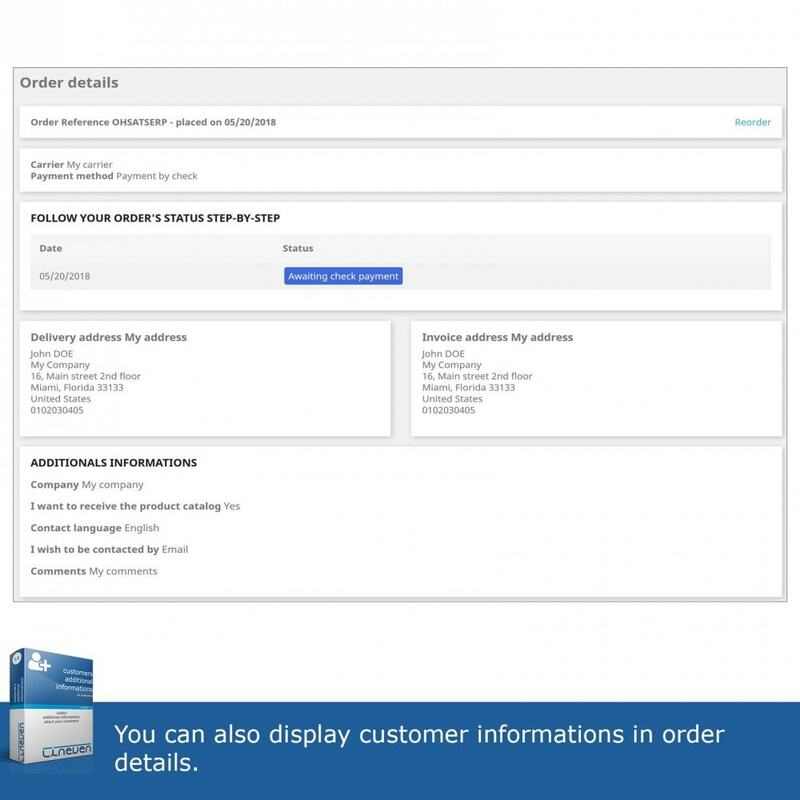 Collect additional customers informations with extra custom fields during the registration and/or order process. 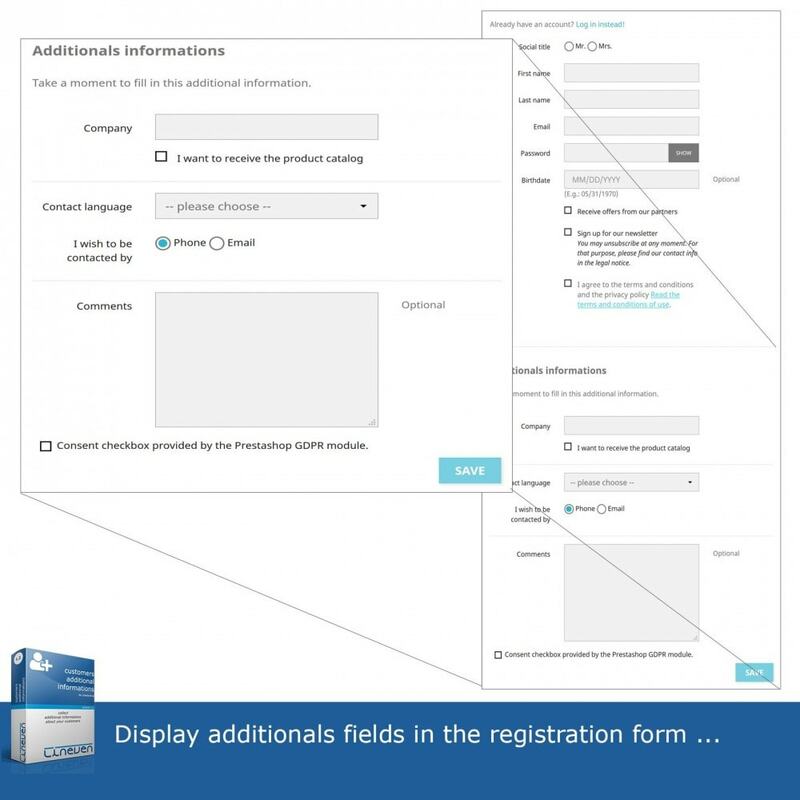 Design a fully customizable form to collect informations that you consider pertinantes. 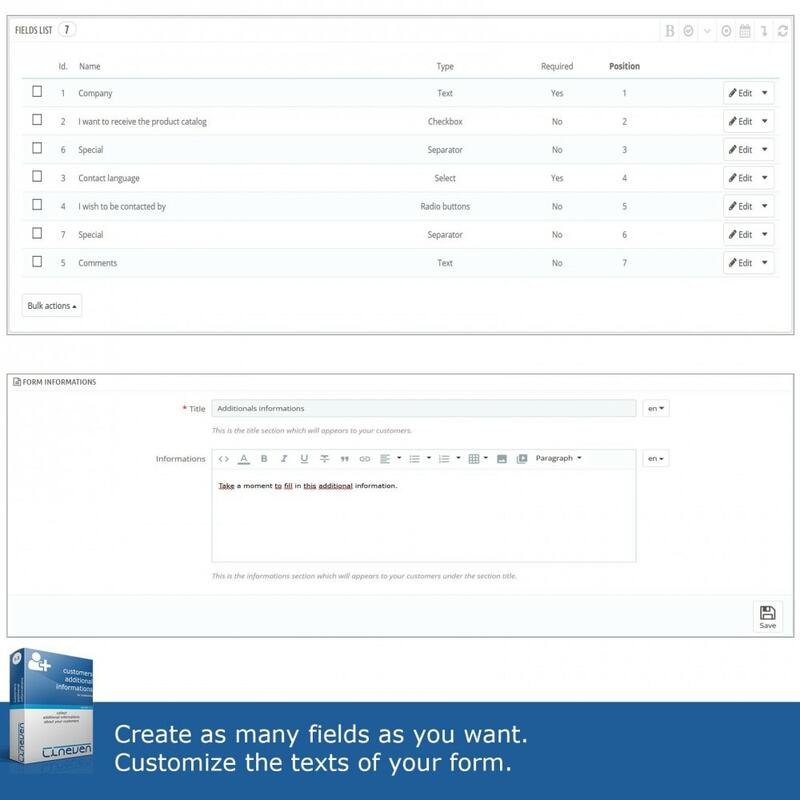 Your form can be in several languages​​, and supports multi-store mode. 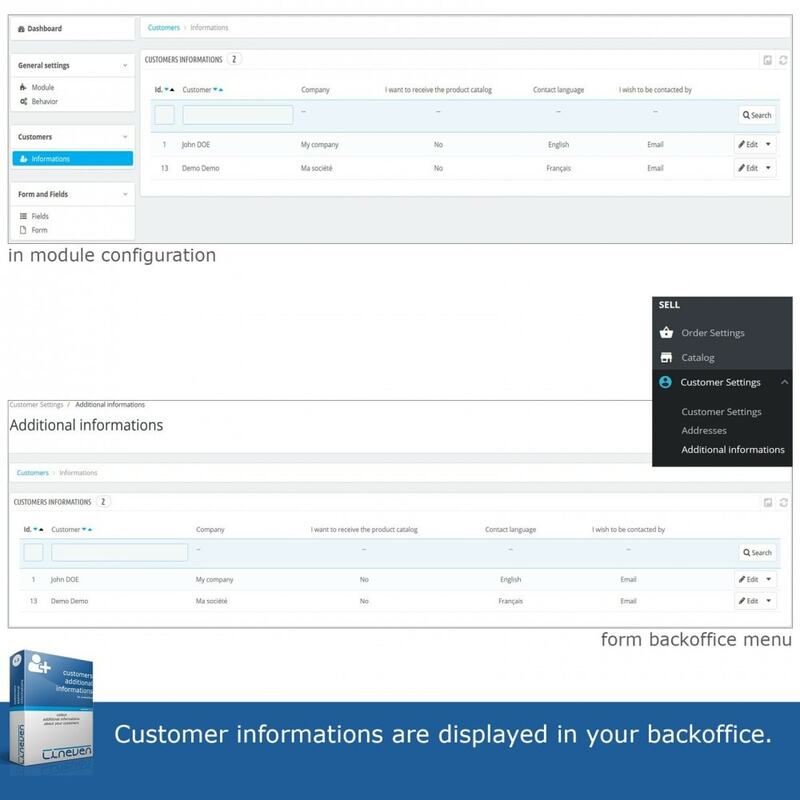 Test mode available (by IP address control) to configure the module without impact to your customers. 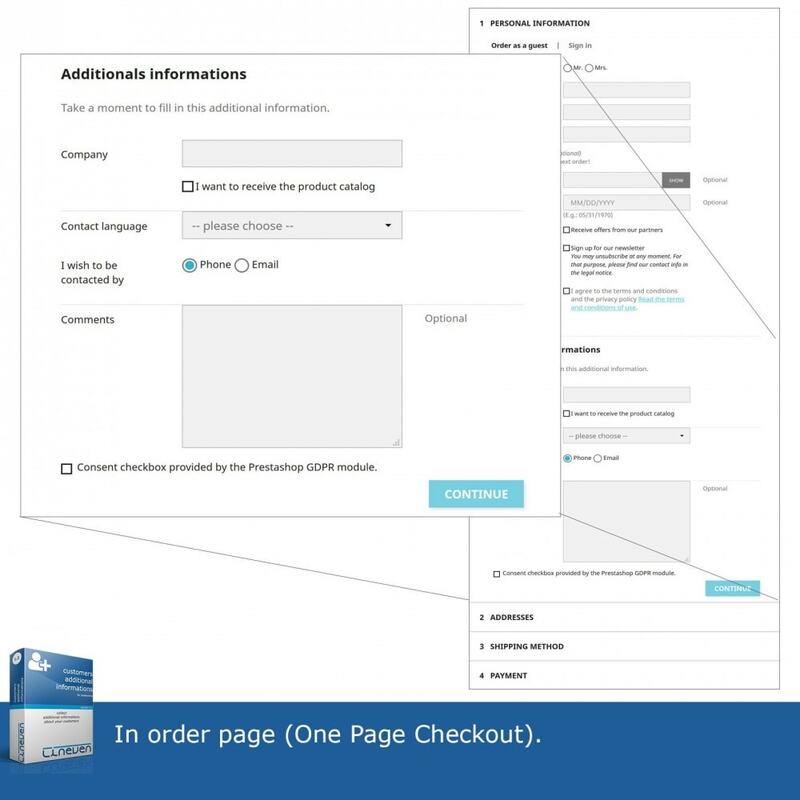 *During registration in the control phase of type "One page checkout", the form will be presented to the client in the registration form. 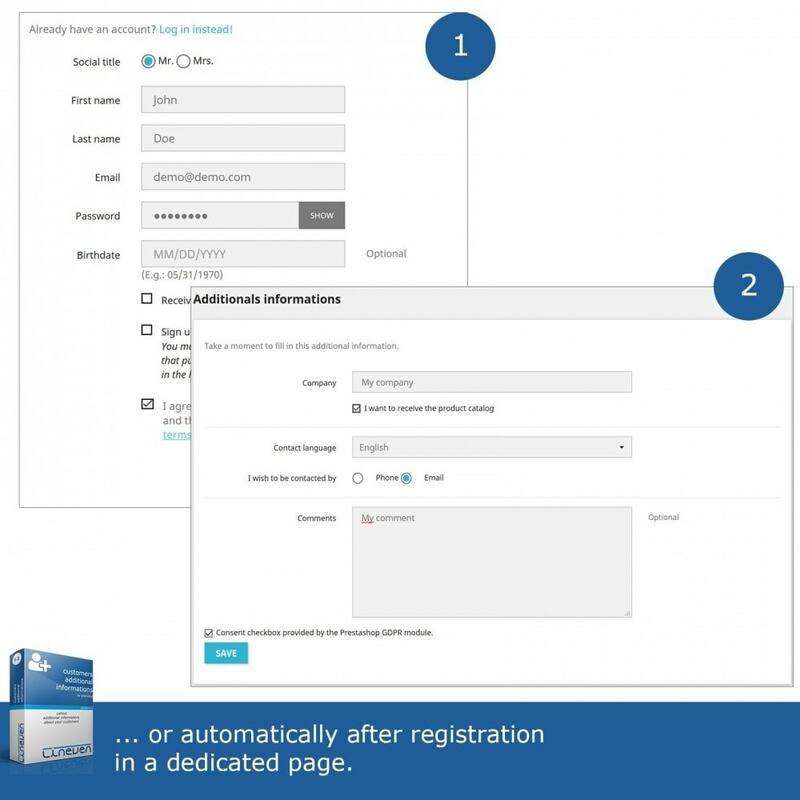 However, during this process and for the form you created, PrestaShop will not block the registration process if informations filled by the customer do not match with your criteria of validity (eg the customer do not fill a required field). 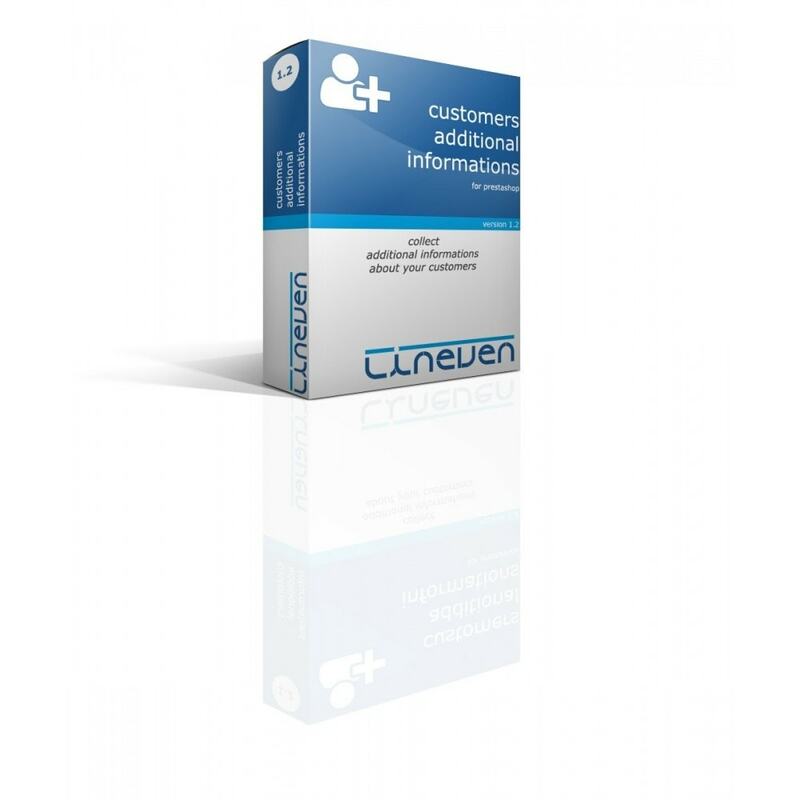 Informations that the customer has entered will be saved and the customer will be able to change them later. Este módulo crea el cupón de descuento para el sponsor y amigos, cuando hacen el registro o pedidos. El registro de un amigo está disponible a través del email o teléfono del sponsor. Hay muchas opciones configurables en este módulo. For Prestashop versions 1.6 and 1.7, this module stores data entered by your customers. 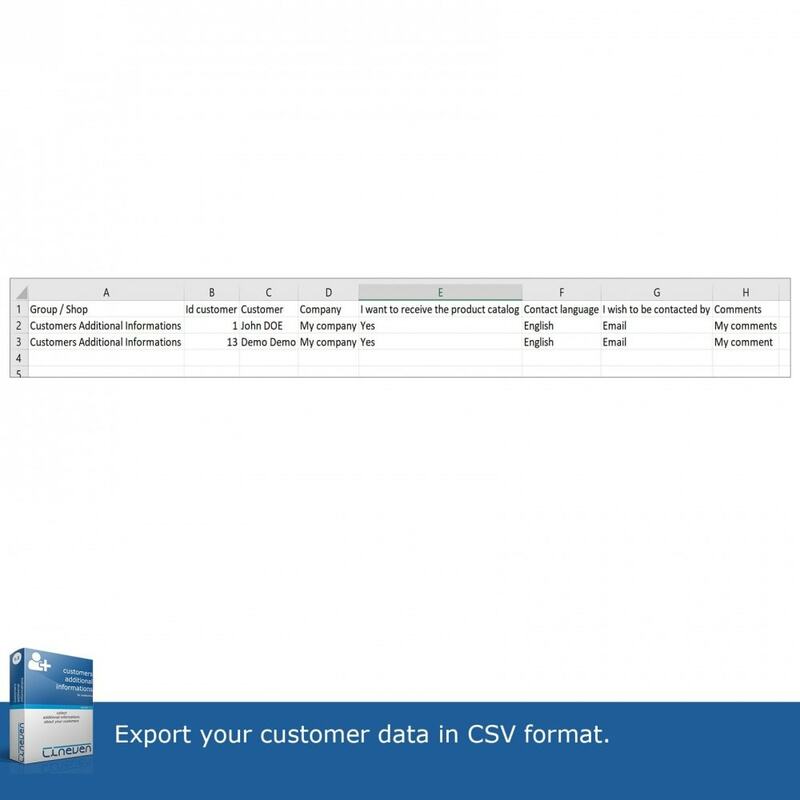 This module allows you to create a fully customizable form and fields to allow your customers to fill additional informations. 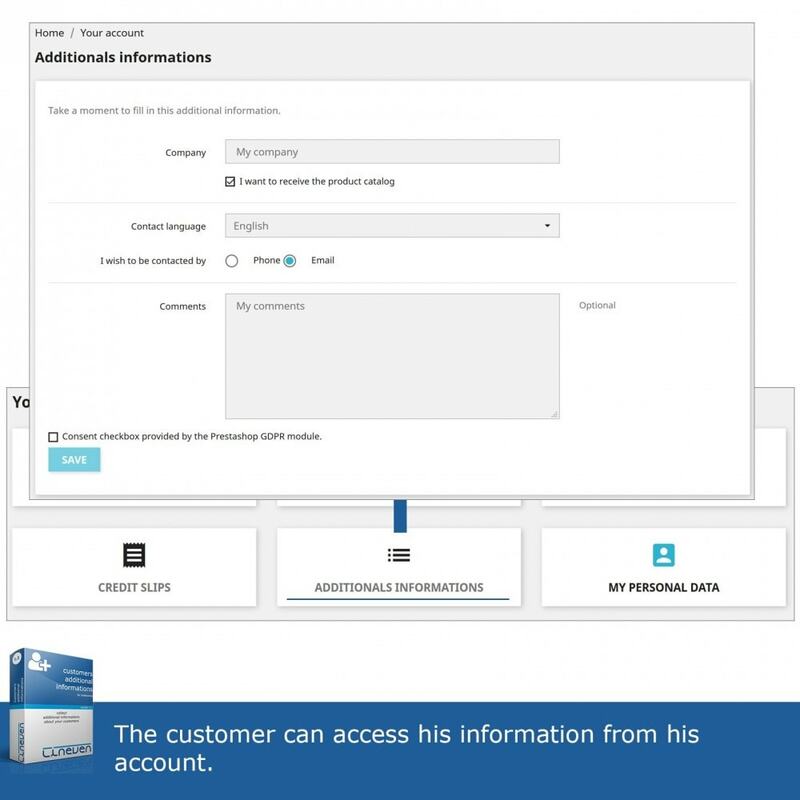 Depending on the use you make of this module and the fields you will create to collect the information needed, you can implement processing of personal data. Therefore, this module is compatible with the Official Module GDPR published by Prestashop to help you comply with the general regulations. 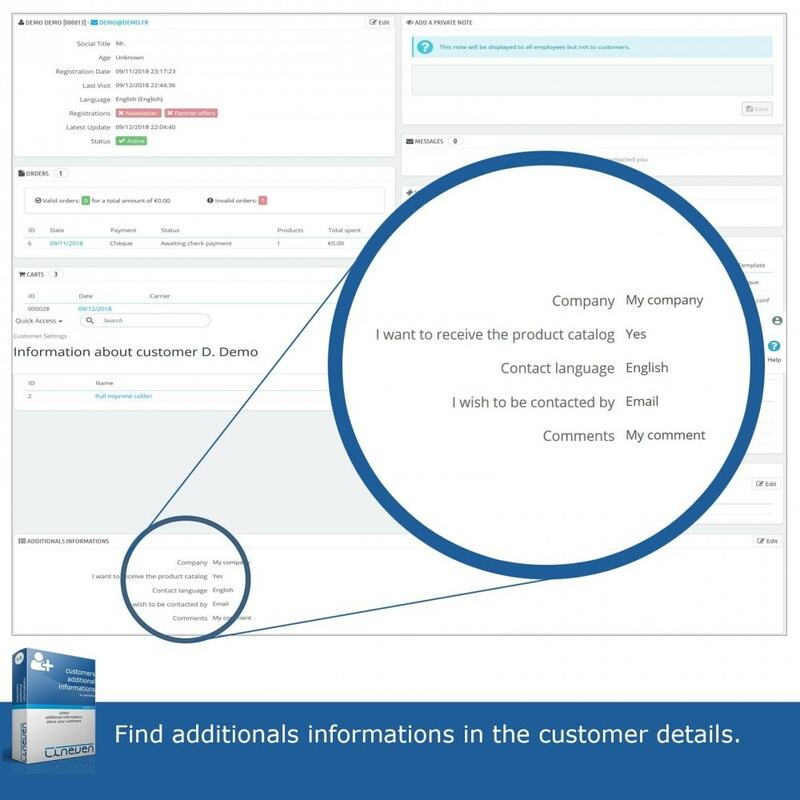 These features are intended to help you in your compliance. It is your responsibility to put in place all the necessary actions to ensure your compliance. Backoffice menu : Fix bug with link to the module. GDPR : Fix non-static method.